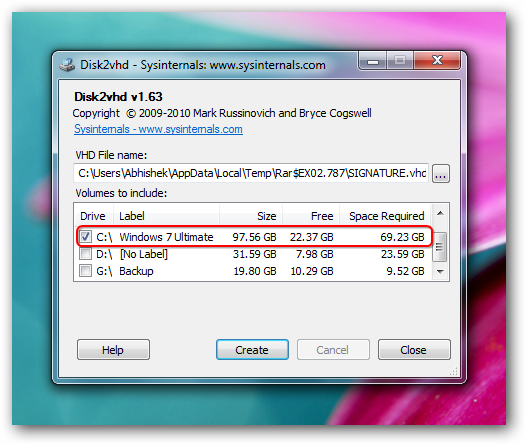 Virtual Machine From Physical Machine creation is possible by using Disk2VHD, a free Windows utility that is actually intended for the reverse usage. Reverse means, a gross user usually wants to create a Virtual Machine of their computer, but the reverse usage, that is Virtual Machine From Physical Machine is probably more important for the enterprise level user as the user can use his/her own disk image to run that Physical Machine as Virtual Machine on any computer. Click the create button to create the disk image of computer. Disk2VHD is Free, but not Open Source. In other words, you can not compile it with other software for the way you are thinking. Quite obviously, this image will have all the softwares you already have installed. As we pointed in our article, how to Run Any Operating System on Windows Using VMware Player Freeware, you can basically run it on a Physical machine as VM or run Virtualization on Virtualization. It is quite obvious that you can actually run even the OEM version Virtual Machine From Physical Machine in this way. But Microsoft’s complex EULA basically legally do not permit it. This Article Has Been Shared 4164 Times! Ubuntu USB Drive Live and Virtualization Enabled Video Guide is the companion video guide for our guide to Run Ubuntu as Live USB or Virtualization. Cite this article as: Abhishek Ghosh, "Virtual Machine From Physical Machine Using Disk2VHD," in The Customize Windows, November 12, 2012, April 24, 2019, https://thecustomizewindows.com/2012/11/virtual-machine-from-physical-machine-using-disk2vhd/.